(3.3/5)Crown Majestic series V3 is an automatic pet feeder that feeds your cat and supplies water to your feline friend all in one unit. The Crown Majestic is suitable for dogs and cats and it offers a maximum capacity of 4.4 Lbs dry food. The Crown Majestic V3 allows you to record a personal voice message that will play calling your cat to eat. No tools are needed for assembly. The water disposal system goes attached to the main feeder and is optional. Note: Crown Majestic version, VR2 “Regular Feeder” dispenses in 1/8 cup increments, but this version has limited supply and it’s offered only when available. Crown Majestic Diamond V3 version supersedes the V2 and V2R versions. Made of durable non-toxic material that is environmentally safe. It dispenses up to 4 feeding times per day. LCD screen displays # of cups per meal and time of dispensing. It works with 4 AA batteries as main source (not included). Can be powered with AC 6V adapter (included) in conjunction with the batteries as backup. Simple to program the mealtimes by intervals (1 feeding every 24 hrs, 2 feedings every 12 hrs, etc.). Plays a 12-sec recorded message every time the food is dispensed. Low battery indicator on LCD screen. Anti-tipping, it stays stable in position. Protective guard to safeguard pets with tiny paws from pulling food inside out the feeder. 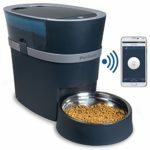 Can be programmed to dispense 1/4, 1/2, 3/4, 1 and 2 cups of dry food. Water bottle features a spill proof gravity system to replenish the water bowl without spilling or overloading. Detachable water bottle, drinking bowl and food container for easy cleaning. New addition: stainless steel insert for the food tray. You can feed your cat from 1 up to 4 meals per day at default intervals of 12-8-6-4 hours between each meal. 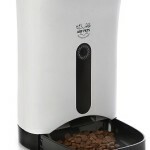 The feeder works in 1/4-cup increments, dispensing a minimum amount of 1/4-cup. The accuracy of the Crown Majestic V3 is better when using spherical rounded kibble with 1/4″ size diameter. Small flat disc-shaped kibble (as the prescription diets) are not recommended to be used with this feeder because the dispensing accuracy is not guaranteed. If you want the feeder to dispense more or less than the default 1/4-cup, you can adjust manually the portion by lifting or dropping a slider (safe-guard) located on the food gate that will help to reduce or increase the portion. You can test through trial-and-error method until you’ll get the desired amount of each meal. To make sure you will set the desired amount of food to feed your cat, we recommend you to test the feeder several times through a trial-and-error method. Use the one-button test for this purpose. You can manually unlock the cup size adjuster to your kibble size to get your ideal portion. The adjuster must be raised by dislodging the pin insert that holds it into a set position. The feeder works best with standard round or square shapes. 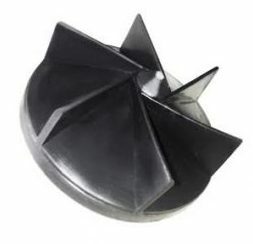 Very small disc-shaped, stars, triangles, etc., can get hung up and jam (see impeller image). 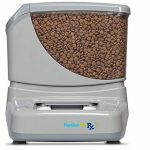 If you need a feeder whose internal rotating piece can be adjusted to a kibble size and shape, you can check the Pet Feedster here. Water bottle has to be clean regularly to make sure it won’t mold. You have to set the bottle in the correct position to make it dispense water in a reliable way. It’s recommended to use this feeder with batteries as they are the main source of power of this feeder. AC adapter is included and it can be used in conjunction with batteries as backup. To delete a previously recorded message and mute the voice feature, simply press “REC” button once and wait till the screen displays the function, then press “REC” again to stop the process. By doing this, you will delete the message and deactivate the recording feature. If your cat is very aggressive when it comes to getting food, do not use the plastic globe. As the extra hopper is transparent your cat will see the food and will think in a way to defeat the feeder. If your cat tries to get food from the feeder with its paws you can ask the company to send you the “protective guard” to insert in the feeder, free of charge. If your cat is very clever when it comes to manipulate objects, lids, etc., check for a cat-proof automatic feeder. 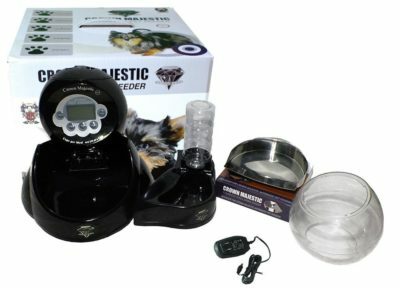 What are the Pros and Cons of the Crown Majestic V3 pet feeder? The basic unit is solid. Adjustable meal portions according to differently kibble sizes (manually). The voice message can be deleted and you can mute this feature as well. It works with batteries and AC Adapter in conjunction. Good for two cats by setting larger portions (up to 2 cups of food at a time). Protective safeguard will stop your cat from trying to stick its paws up inside the feeder to pull out food. You can use the one-button test to check how much the unit is dispensing. You can use this function to feed an extra meal as well. It comes with a water bottle station that you attach to the feeder. Good capacity of 4.4 lbs dry food (2 kg.) with the extended bubble container. It works with intervals so you can only choose the time of the first meal and the following are set by the intervals. The minimum interval is 6 hours and the maximum interval is 24 hours. The feeder does not retain the programming when turned off, unplugged or when changing batteries if is not plugged in. The unit doesn’t allow you to program the portions sizes individually. The same portion will be dispensed each time, and portions are only in ranges of quarters of a cup. Loud noise when the feeder is operating (depending on how sensitive to noises you are). Plastic bubble container does not fit into the unit tightly. The water bottle is too small and flimsy plastic. The food bowl is not detachable for easy cleaning. The feeder does not work properly with all type of kibbles. 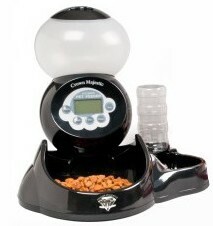 The feeder’s mechanism clogs if you feed your cat very tiny, flat disc-shaped kibbles or triangle, stars, etc. The amount of food dispensed and accuracy depends on the kibble size you are using. You can adjust the unit to your kibble size by moving a sliding plastic piece inside, in front of the feeder. The system jams if using flat disc-type kibbles or odd shaped kibbles because they get caught between the rotating impeller and the wall of the hopper, as the impeller rotates horizontally. If you want the minimum portion to be less than 1/4-cup you can slide a piece inside of the unit to narrow the food gate. Using at least a 1/4″ diameter size, spherical shaped kibble will give you more accuracy. The minimum portion of 1/4-cup (2 Oz or 57 gr.) equals to one rotation of the impeller. You can set up how many times you want the hopper to rotate. The schedule is set by intervals so you cannot customize your cat eating schedule, you can choose only the first meal time. 1/2-cup to 1 cup a day. If you want to feed your cat a total amount of ½-cup per day, you have to feed your cat twice a day, every 12 hours (1/4 cup at a time). If you want to feed your cat one cup daily, just set the feeder to feed 1/2-cup, twice a day, one meal every 12 hours. Three-times-a-day feeding schedule. If you want to feed your cat 3 times per day you have to feed your cat a total amount 3/4-cup per day, one meal every 8 hours. 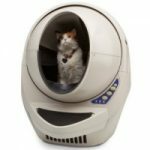 If adjusting the feeder’s sliding piece inside and using spherical rounded size kibble (1/4″ diameter or more) you may be able to feed your cat a daily amount of 2/3-cup, depending on the size of the kibble. Four-times-a day feeding schedule. If you want to feed your cat 4 times a day, you have to feed your cat every 6 hours, entering a total amount of one cup. This schedule is more appropriate to feed two cats so you can feed each cat a total amount of 1/2-cup per day*. *Note: A normal intake for an active adult cat is approx. 1/2 cup to 3/4 cup of dry food by day but this amount will depend on the quality of the cat food you feed your cat. If the quality is high in proteins, the recommended amount is less (approx. 2/5 cup). Your cat’s feeding schedule doesn’t fit with any of the schedules and portions mentioned above. You want a customized feeding schedule for your cat. If you want a feeding schedule for your cat with less than 6 hours intervals between each meal. If you feed your cat flat disc-shaped kibbles or triangle, flower or star-shaped kibble. This feeder ended up being a terrible decision. It lasted all of 5 months before it stopped working. The machine began to constantly freeze and stop dispensing food. I was away for one trip and asked a friend to check in on the cats on a gut instinct. It had stopped working while I was away. I tried everything to contact the company – their email – twitter – facebook – you name it. The say they guarantee a 1yr warranty but refuse to reply to any forms of communication. They have THE WORST customer service. I recommend anyone who buys this, to try it for a few months before posting reviews. Hi Severina, thank you very much for sharing your experience with this feeder. This unit has more good than bad reviews but it’s a great help that you posted this because it’s important to have good customer service always, even after 5 months of using a product.